Neem contact op met dennis(a)tccstudios.com als u Tanya Goodman-Sykes wilt laten zingen op uw album of nummer. Credits : Dolly Parton, Gaither Vocal Band, Barbara Fairchild, NewSong, Crabb Family, Walt Mills, Rusty Goodman, Lauren Talley, Mark Lowry, Greater Vision e.v.a. Over Tanya : Grammy-winning songstress, Tanya Goodman-Sykes, was born into gospel music royalty. 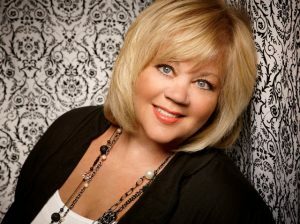 As daughter of the late Rusty Goodman and niece to Howard and “Queen of Gospel Music” Vestal Goodman, Tanya grew up in an environment where creating great songs and communicating the Gospel through music was a way of life. Now an award-winning songwriter and vocalist in her own rite, Tanya has in no way rested on the accolades of those who came before her. Taking all she learned from her talented family, she continues the family legacy with a calling all her own as a songwriter, solo artist and founding member of Dove-Award-winning trio, Heirloom. Her smooth alto voice lends itself beautifully to the numerous children’s albums she has written and recorded, including the Grammy-winning Rock-a-bye Collection and widely acclaimed, A Child’s Gift of Lullabies. Tanya is featured in dozens of volumes in the award-winning Gaither Gospel Series, exposing her to television audiences around the world. Among her all-time best-loved performances is a beautiful interpretation of the song her father wrote years earlier, “Look For Me,” on the Gaither Homecoming DVD entitled, Singin’ With The Saints. As a songwriter, Tanya, along with her husband, Michael Sykes, has penned #1 gospel hits “The King of Who I Am” (recorded by Lulu Roman, Russ Taff and others) and “Prayer Warrior” (recorded by Heirloom) among the couple’s many musical accomplishments.